Make the perfect cookies this festive season, where you can decorate it however you like with delicious icing, pearls and ornaments. Using a hand or stand mixer, mix butter and caster sugar until creamy. Add lemon zest, salt, almonds and mix again, than add egg and mix well. Sift flour into the butter/egg cream, then mix just until dough comes together. Remove the dough from mixing bowl, pat into a rectangle and cover in cling wrap. Refrigerate for at least one night before using. Roll out dough on floured surface, 5 mm thick. Cut out different cookies and put on a baking tray, lined with baking paper – try to put cookies of same size on a tray, so the baking time will be the same. Bake in preheated oven at 175 degrees C. for 10 minutes or until golden brown. Let cool out, then decorate with icing & sugar pearls. Beat egg white and lemon juice with a hand or stand mixer until white and fluffy, not firm. Stop beating and add icing sugar – mix first on slow speed, then on high speed, until very glossy, thick and smooth. Add more icing sugar if too runny! Divide icing into bowls and colour with food colouring of your choice. 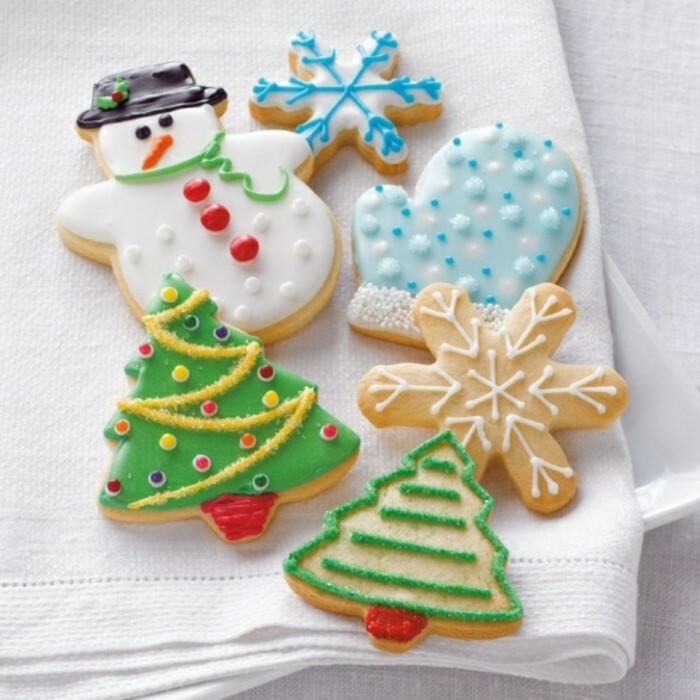 Divide the colours in small piping bags and decorate the cookies. Add sugar pearls & small decorations.